The San Diego Blood Bank and SDSU Aztecs are teaming up once again to increase blood donations. 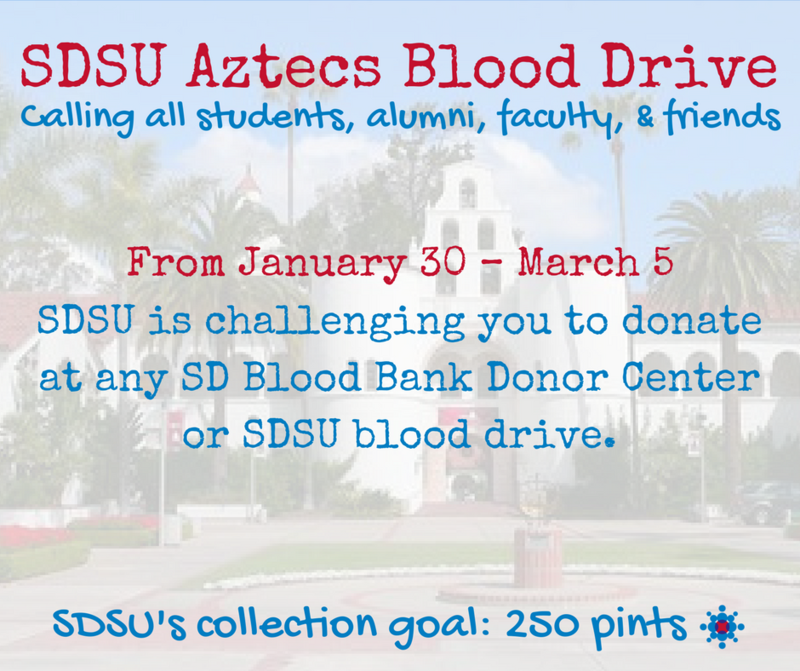 SDSU is challenging students, alumni, faculty and friends to donate at any of our 6 Donor Centers or at one of the drives on campus to help them hit their goal of collecting 250 pints. Starting January 30th – March 5th, when donors AT DONOR CENTERS mention the code SDSU at registration or anytime during the donation process, they receive a coupon for a free Jersey Mike’s sub sandwich (valid at the College location only). Those who donate before February 10, are also entered into a drawing for 2 VIP hospitality tickets for the Feburary 12 game against Nevada. Those who donate before February 20 will also be entered into a drawing for 2 VIP hospitality tickets for the Feburary 22 game against Fresno State. Aztecs, make your appointment now to save lives!